I didn’t actually get a lot of books read in March. Mostly because one that I did read, Words of Radiance, was so gosh darn long it didn’t leave me a lot of time to read anything else. Also, I’ve managed to clear my pile of unread physical books down to just a handful and fantasy novels. The problem with those is that they tend to be really long, which hurts my overall count. Still, I expect to get back on track in April and May. The second part of Sanderson epic doorstop series is even better than the first. It does have its rough patches, not unsurprising for a book with a page count well over one thousand, but is overall a very entertaining read. The Stormlight Archive certainly has a different feel than most doorstop fantasy series. While it is only two books in, Sanderson has done a great job of keeping the focus tight. While he is carefully illuminating the fascinating world this series takes place in, the focus has remained on a cast that is remarkably small for a book this size. There are a few chapters that, at this point, are simply world building. The bulk of them, however, follow just a few characters; Shallan, Kaladin, Adolin and Dalinar. Also, by the middle of this volume they are all in the same geographical place, further centralizing the narrative. While the first book belonged to Kaladin, following his origins and journey, this one is Shallan’s. Here we find out her history and what made her travel halfway across the world to steal something from Jasnah Kholin. Kaladin still has his part, but Shallan is the big mover here. 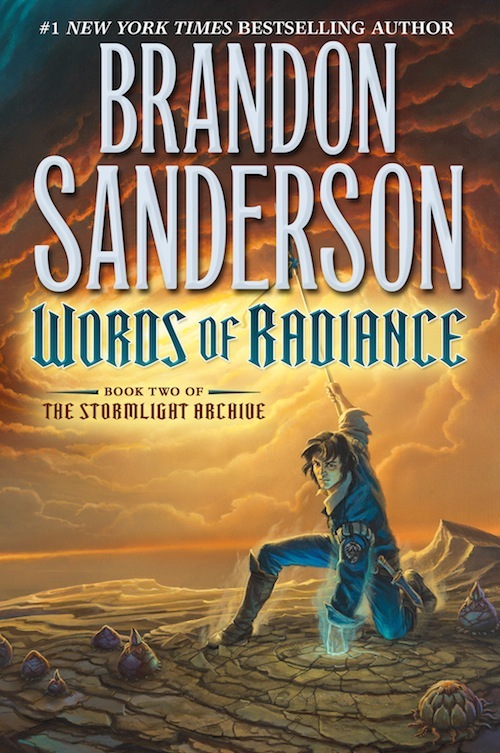 The parts of Words of Radiance set in the present, most of it, were excellent. Especially Shallan’s growth from a sheltered young girl to a more wise and cunning woman, a real player in these machinations. But her past, while not without merit, seemed a little “after school special”-y to me. That sounds harsher than I really mean it to. Her situation is largely gotten across quickly in those scenes, but Words of Radiance repeatedly returns to belabor the points, every time giving just a glimpse more. That recipe worked much better in the first book, but I was not as big a fan of it here, despite actually liking Shallan more as a character than Kaladin. Most of these epic fantasy series have larger than life protagonists. They are generally heroes, if not at the start then by the end, and accomplish great, near superhuman feats. In The Stormlight Archive, many are expressly superhuman. At first it is due to the Shards, weapons and armor that grant magical abilities to their users. As this book goes on, the Knights Radiant, people with great powers who “failed” and faded into legend, begin to be reformed and their great powers return. The exceptionality of the protagonists and antagonists is made explicit. They are not really normal people anymore. This is not something unique to this series, but the proliferation of such specialness is. In the Wheel of Time, only Mat, Perrin and especially Rand had anything like that. It definitely gives the series an interesting hook. In the end, what you get with a Words of Radiance is a classic feeling fantasy epic that really does its own thing. Sanderson is putting his own spin on classic elements to create something that, while not exactly new, is still refreshing in a world where most epic series are more than a decade old. I read this for a book club that I’m in. 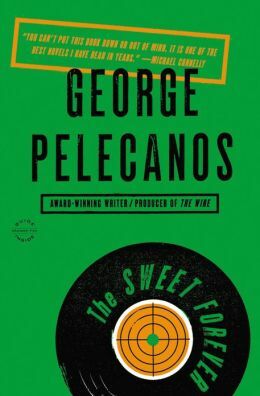 I wasn’t really familiar with Pelecanos or any of his work, but I really liked this. It is a crime story set in the 1980’s, apparently the third in a four book cycle set in Washington DC during four different decades, with some recurring characters and an emphasis on the evolution of the city. The Sweet Forever starts with a gangbanger dying in a car accident and a guy who happens to be around steal a big bag of drug money out of the car. The rest of the dead boy’s gang are on the lookout for the money, as are a couple of corrupt cops. The only witness to the theft of the money is a youngster who likes to hang out around the local record store, which is owned by Marcus Clay, the one of the recurring characters of the series. I don’t want to give away much of the plot, but it obviously builds from there, with these various factions playing off each other until everything comes to its bloody conclusion. There are a lot of things woven in with the crime plot. For starters, it all takes place during the opening weekend of the NCAA Basketball Tournament. Nearly all the characters are watching Georgetown and Maryland, the local schools, especially Maryland star and eventual second overall draft pick Len Bias. There is also a lot of very casual cocaine use. Drugs are an ever present threat, with cocaine and alcohol and the foreknowledge amongst the police of the coming scourge of crack. That ties back in with everyone’s love of Len Bias, who would die from drug use only a few days after being drafted. It lends the whole thing a sense of macabre irony. So a great read all around. Presidential Elections: From George Washington to George W Bush. Another thing I found on the Kindle Store. 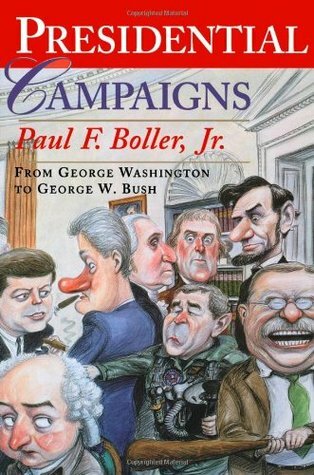 It gives a rough overview of every Presidential campaign up to Bush and Gore in 2000. It is not particularly in depth on any of them, but it is a nice introduction to the issues brought up in each of the campaigns. This wasn’t anything particularly profound or enthralling, just something I read a chapter or two at a time before bed for half a month. I was in it more for the historical side, but the emphasis was more on the recent elections with a more political focus. That is not surprising, the more recent elections will obviously be better documented, but I’d rather read about the 1912 or the 1824 election than the 1992 election. Still, it was entertaining enough.